Grinding noise from the power steering pump may be heard immediately after the engine is started in extremely cold conditions (below - 4°F). If the noise stops during warm up, there is no abnormal function in the system. 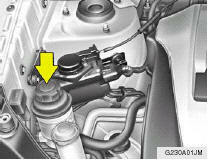 It is due to a power steering fluid characteristic in extremely cold conditions. Do not start the engine when the power steering oil reservoir is empty.